Lake Placid has it all: back-country adventure, Olympic thrills, upscale and family-oriented lodging and dining, European ambience, history, arts, and an endless list of activities. The outdoor adventurer can cruise down Olympic trails at nearby Whiteface Mountain; cross-country ski and snowshoe at several venues (including the Olympic site at Mount Van Hovenberg); hit the links at several top-notch courses; ride a bobsled and a luge sled down the Olympic track; hike, rock-climb, and ice-climb a few short miles from the center of town; paddle the nearby waters; and fish the area's many streams, lakes, and ponds. Less-athletic activities also abound. Simply walking along Main Street, exploring the eclectic variety of restaurants and shops, is an experience to be treasured. The Olympic venues offer non-stop opportunities to watch world-class ski jumping, biathlon, cross-country racing, free-style skiing, hockey, and downhill skiing, as well as luge, bobsled, and skeleton racing. 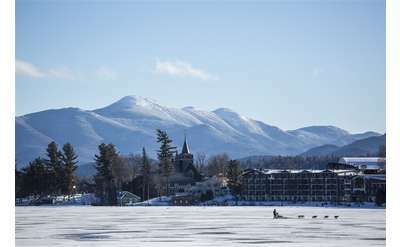 No matter what your tastes may be, Lake Placid is truly your year-round destination. 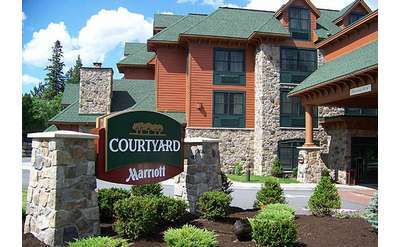 Experience the best in Lake Placid lodging at the Courtyard Marriott Lake Placid. With spacious rooms, abundant amenities and Adirondack charm, our hotel will leave you feeling relaxed and refreshed, whether you're traveling for business or fun! Dis-lodge from the ordinary, and re-sort in the Adirondacks. High Peaks Resort's three unique lodging experiences make the perfect base camp for your tailor-made vacations and events in the world-renowned village of Lake Placid. When it comes to Adirondack lodging and hotel accommodations, Lake Placid Summit Hotel, Resort and Suites, is perfect for the family or business traveler. Located in the heart of Lake Placid, NY, Placid Point is a beautiful custom vacation home featuring four bedrooms, four and a half bathrooms, and an idyllic wooded property near Main Street. 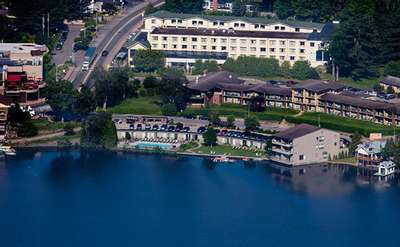 The Hotel North Woods features 92 guestrooms and suites, many with breathtaking views of Mirror Lake and the High Peaks. Quarry Pool Falls is a 3- to 4-foot waterfall that goes over a small dam and through a gorge before the river goes into Quarry Pool, a well-known fishing spot. Visit Country Dreams Farm at their Lake Placid location in winter and treat yourself to an authentic horse-drawn sleigh ride at the John Brown Farm State Historic Site. Their sleigh rides are perfect for friends, families, and romantic evenings. Placid Bay Inn "On Lake Placid" - Enjoy the peace and quiet of your Adirondack home away from home, right on Lake Placid, with canoes, outdoor pool, Adirondack chairs for lounging by the Lake, and free Wi-Fi. All accommodations are newly renovated. Located at Whiteface Club & Resort on the scenic shores of Lake Placid, the Moose Lodge Boathouse Restaurant offers a casual, family-friendly dining experience. Relax on their spacious deck and take in the incredible views of the lake and mountains. Adirondack Premier Properties manages a variety of vacation rentals from townhomes & condos to waterfront private homes. Are you looking for an elegant meal with stunning lake views? Reserve your table at Artisans at the Lake Placid Lodge. You will enjoy delicious, fresh and seasonal cuisine with incredible views of the lake and mountains. Custom-designed casual apparel for all ages, produced locally in Saranac Lake. Custom embroidery and screen printing also available. Big Mountain Deli & Creperie is the place to get a quick breakfast or lunch in Lake Placid. Their gourmet sandwiches are perfect for packing to take on a hike or on the lake, and you won't believe you're not in France when you try the crepes! Serving excellent Italian cuisine, Caffe Rustica's chefs trained at the Culinary Institute of America. Their lunch and dinner menus include fabulous sandwiches and mouthwatering pastas. Captain Marney's Boat Rentals in Lake Placid offers boat rentals for any need, goal, objective, or budget. Their selection includes engine-powered boats, canoes, kayaks, and water sports equipment. This 18-hole course runs April-November, weather permitting. Owned and operated by the Town of North Elba, this course was designed in 1925 by Seymour Dunn. Available on-site are a pro shop, practice facilities, and a restaurant & lounge. With sizzling steaks, fresh seafood and award-winning handcrafted ales, this the perfect place for great food and a good time. Two private dining spaces also make it an ideal option for rehearsal dinners, petite weddings and private parties. In the mood for Italian? Stop in to Jimmy's 21 for Italian American dining at their waterfront Lake Placid restaurant. John Brown was a devoted abolitionist who sought to ignite rebellion among the slaves. Kid friendly until 9:30 pm, the Kanu Lounge boasts a wide variety of craft brews, signature cocktails, and more than 400 wines. The restaurant serves modern American cuisine with special menus for kids and your gluten-free friends. Lake Placid Center for the Arts presents exceptional music, dance, and theater performances, plus visual arts presentations and film exhibitions. The Center also offers workshops, residencies, and other educational programs. With 3 courses to choose from, the Lake Placid Golf Courses offer a variety of golf for players of all levels. The course designs offer beautiful views of the Adirondacks surrounding them. The course is just a short half mile from hotel. The Lake Placid Farmers Market will take place every Wednesday from 2pm to 6pm from June 12 through October 9, 2019. The market will be held at Jewtraw Park in Lake Placid. The Lake Placid Olympic Jumping Complex was built for the 1980 Olympics and features two jumps that are 90- and 120-meters tall, respectively. There is also a smaller freestyle hill where aerialists practice and compete. 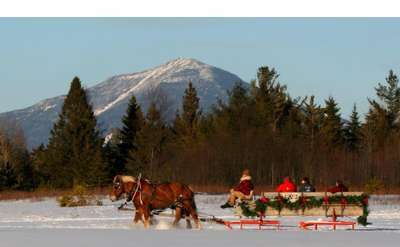 Luxury sleigh rides at the Olympic Village of Lake Placid, NY with options for both a group sleigh ride and a one-horse open sleigh ride for a more intimate mountain experience. The Lake Placid Youth Athletic Association's mission is to introduce, instruct, and promote participation in sports for youth living in the Lake Placid Region. Want to eat like a local in Lake Placid? Head over to Lisa G's. Serving comfort foods with a modern twist, Lisa G's is a local favorite for lunch and dinner. Maggie's Pub is a popular spot for unwinding after a day on the slopes or out exploring the park. With plenty of hearty pub food and good drinks, the pub offers both indoor and outdoor seating and plenty of good fun! Mirror Lake Boat Rental in Lake Placid offers a wide range of boat rentals, including paddle boats, canoes, kayaks, stand up paddle boards, sailboats, electric boats, and more. Students at the North Country School will receive a progressive education that makes real-world connections to the classroom. This co-ed boarding school accepts students in grades 4-9 and offers unique programs in the arts, agriculture, and more. Private boarding school in Lake Placid offering a variety of educational pathways for students in grades 9-12. In addition to traditional college-prep curriculum, Northwoods School offers paths in the L.E.A.P. program, innovation & design, and more. Plan a trip to Lake Placid for ice skating at the Olympic Speed Skating Oval and the Olympic Center. Small fees apply to ice skate at both the outdoor and indoor rinks, and rentals are available. A full-service specialty clothing, skiwear and accessories store right in the heart of Lake Placid. Offers a wide variety of styles for both women and men. St Agnes School is a private Catholic early learning center in Lake Placid. Students from pre-K through 3rd grade enjoy a whole-child approach to education that encourages academic and social growth. Are you looking for a fun, casual evening with finger-licking food? 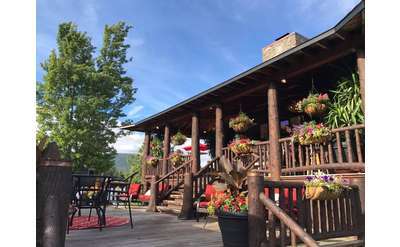 Try the barbeque and live music at Smoke Signals in Lake Placid! Serving award-winning wings, spicy chili, and BBQ classics, Smoke Signals has something for everyone. Taste Bistro & Bar is recognized for a warm, friendly, and casual atmosphere where food and drink are the primary focus. Located on Mirror Lake, this bistro has a great location and even better food! Serving artisan espresso on the lake, The Breakfast Club, Etc. is the place to go for breakfast all day in Lake Placid. Stop in for a leisurely brunch with friends, an early breakfast with the kids, or a relaxing afternoon snack. If a lighter fare, pub-style menu is more to your liking, visit The Cottage on Mirror Lake for lunch or supper. 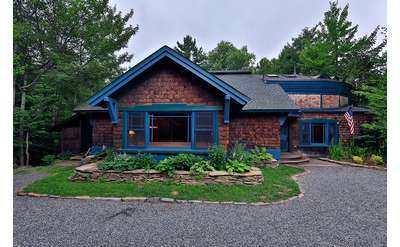 The Cottage offers a cozy dining room and waterfront deck with views overlooking the Lake and the stunning Adirondack High Peaks. Just short walk from the shops, Mirror Lake, and Lake Placid, Interlaken Inn & Restaurant is a quaint inn with world-class dining. Experience their award-winning menu and extensive wine list for yourself! This award-winning restaurant is right on Mirror Lake and offers stunning views to go with their world-class menu. You will love your fine dining experience at The View. Offering signature cocktails, a wide variety of beers and wines, and delectable small plates, Top of the Park has one of the best views in Lake Placid. Grab a drink and pull up a chair on their lakeside deck! 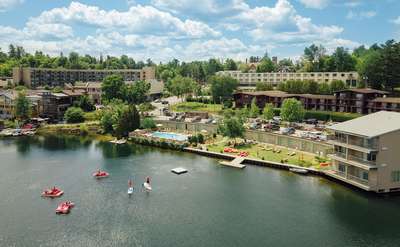 Located amid The Adirondack Mountains of upper New York State on beautiful Lake Placid Lake. Hike, sail, swim, kayak, canoe, create in arts and crafts and woodcraft. Offers stunning mountain views, indoor pool, fitness center, free internet, suites, free breakfast and a business center. Right across the street from Mirror Lake in Lake Placid NY. Enjoy Lakeside luxury at the Lake Placid Lodge! 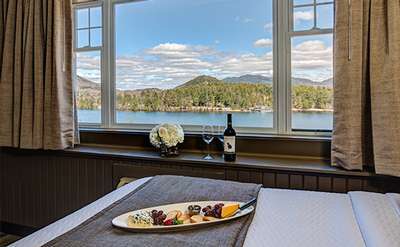 This award-winning retreat overlooks Lake Placid and offers farm-to-table dining, sumptuous lodging including suites and cabins, Adirondack pub, in-room massage, wine cellar and much more. Book now! The Lake Placid-North Elba Historical Society has operated The History Museum in the historic Lake Placid Railroad Station since 1967. The Museum reveals the rich and unique history of the Village of Lake Placid and the Town of North Elba. Enjoy an outdoor pool, free internet, and comfortable rooms with refrigerator, coffee machine, dining table, cable TV and more. Free shuttle service also available. Enjoy The Mirror Lake Inn Resort and Spa, Lake Placid's only AAA Four-Diamond "exceptional" lakeshore resort and fine dining establishment. Relax and unwind in our luxurious suites or spacious lakeside, lakeview or mountainview rooms. You can expect elegantly decorated and delicious dishes when you go with Northwoods Events' catering services. A peaceful Adirondack getaway home with mountain view on Mill Pond. Enjoy a beautiful Adirondack vacation in the Adirondack Mountains near the Olympic village in Lake Placid NY. Your home away from home, Spruce Lodge includes a B&B guest cottages, and 4 townhouses. We provide a clean, cozy, friendly atmosphere less than a mile from the center of Lake Placid. 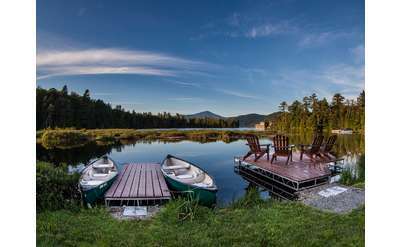 Enjoy spectacular views of Mirror Lake and the Adirondack High Peaks at The Haus, unique Adirondack lodging in the heart of Lake Placid. Offering 10 unique suites with loads of amenities you can't get anywhere else, plus lakefront views and shopping! Enjoy the grand beauty of the Whiteface Lodge - a luxurious resort in Lake Placid with award-winning spa, dining options, luxe accomodations, fitness center, indoor and outdoor pools, event spaces and so much more. Prepare to be in awe! Book now! Go for a dog sled ride in winter across a frozen Mirror Lake in Lake Placid through Thunder Mountain Dog Sled Tours. Coming to Lake Placid? Stay at the Town House Lodge in Lake Placid - a quaint lodge with air conditioning, wifi, seasonal outdoor pool, and on-site parking. In addition to being a great place for friends, food, and drinks, Wise Guys also caters for special events - weddings, rehearsal dinners, and more.